Best Buy will be open at 12:00am on Friday morning. Like last year, tickets will be handed out starting at 10:00pm on Thursday night. Here is a sneak peak at the Best Buy Black Friday Ad. Here are a few of the top deals from their ad. 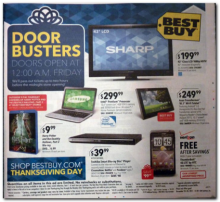 Offers Nov 20, 2011 in BestBuy, BlackFriday, holiday · Expired!